Children make up a large percentage of a dentist’s clientele. One child could have cavities that most adults don’t have. Another child may worry about the pain of certain dental procedures. There are many more reasons why children make the best clients. The following reasons state why it’s beneficial to work with children’s dentist Cheltenham providers. Children are the most important recipients of dental education. They must know basic dental hygiene that is accurate, consistent and complete. Around the age of 6 is when they start brushing their teeth and flossing on their own. Children’s dentists provide them with a foundation of knowledge to get them started. Once they learn the importance of keeping the teeth and gums healthy, they will keep their habits for years to come. It’s difficult for parents to calm down kids before they undergo scary procedures like root canals or fillings. Adults don’t look forward to the pain and discomfort, but they undergo the procedure with little fear and hesitation. In contrast, young children’s dentist Cheltenham patients must be reassured that the treatments are safe and necessary for good oral health. Many dentists remind these patients that not going through with the procedure is more detrimental. When a cavity isn’t fixed, it could become infected. A root canal that’s left undone will lead to more decay and the tooth’s eventual destruction. It’s common for kids to start straightening their teeth at very young ages. Pediatric dentists provide straightening procedures that include braces and Invisalign. A few decades ago, it was necessary to straighten the teeth using metal braces only. Today, there are more options to reduce the pain, discomfort, and visibility of traditional straighteners. Clear aligners, such as Invisalign products, are made of plastic and look invisible against the teeth. Molds of the patient’s teeth are made and manufactured into devices that are placed into the mouth. Ceramic braces use white wires and brackets that blend in with the teeth. The plastic or ceramic material is less noticeable than metal. Ceramic braces also straighten the teeth faster than clear aligners do. Many children have far worse dental problems than adults. They are more likely to eat sweets and grow cavities. They are less likely to brush teeth due to a lack of motivation or not being taught properly. 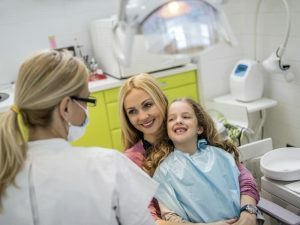 Few parents have the time or effort to teach their children everything about dentistry. At the Jenkintown Dental Medicine office, we provide the children’s dentist Cheltenham services that most parents cannot provide at home. Call us today at (215) 885-6565 to schedule an appointment.